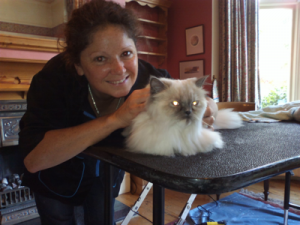 I was quite nervous about getting my beautiful persian kitten Star groomed as she is a little madam who has me wrapped round her little claw – so grooming her is always a battle of wills with me as the loser! As a result her beautiful long coat developed horrible pelts under her arms that I could not comb out. Anita was amazing with her, she obviously loves cats, and Star was so well behaved, even lying out on the grooming table after it a had all finished as if she didn’t want to move! The great thing about Anita is that she made me feel relaxed as well as Star, and I felt really reassured that she was not causing any discomfort to Star. Star looked really great afterwards and was totally unfazed by the whole business! So, after me dreading the thought of trying to get Star groomed without her biting Anita’s face off it all went so smoothly, and I am really happy to know Star has a regular beauty treatment day booked to make sure she stays looking beautiful!